Listeners may call in during the show to ask questions by using this number: (347) 857-3752. Already, 2013 is shaping up as a year of intense experiences and fast changes. During the March 18 radio show, Anne will talk about how “following the Sun” (that is, paying attention to what sign the Sun occupies each month) can help everyone navigate better in stressful times. She’ll also share where the Sun is right now, what that means, and how to make the most of current solar energies. She’ll also explain why this time of year figures so strongly in nature’s rhythms and how it brings special spiritual and mystical significance each year. She and Vandermeulen also will talk about the Moon and how it affects writers, marketers, and businesses. In addition, Anne will talk about Mercury, a planet highly significant for writers, business owners, and anyone who communicates or needs to promote a product or service. This year, Mercury will spend extra time in the zodiac’s water signs, and Anne will explain what this means and how to make good use of this powerful, emotional energy. She’ll also talk about Mercury’s retrograde periods, which tend to coincide with communication and technology challenges, and provide tips on how listeners can capitalize on these periods. With this year’s emphasis on water signs, emotions have come to the forefront. Anne will share ideas for managing your feelings and using them to help create better balance in your life. She’ll also talk about how tapping the “right brain” through art and color can support everyone during times of high emotion as well as promote improved personal harmony. Please join us on Monday, March 18, at 5:30 p.m. CDT. Tune in and hear about “Astrology 2013” and how you can make the most of this powerful time in human history. 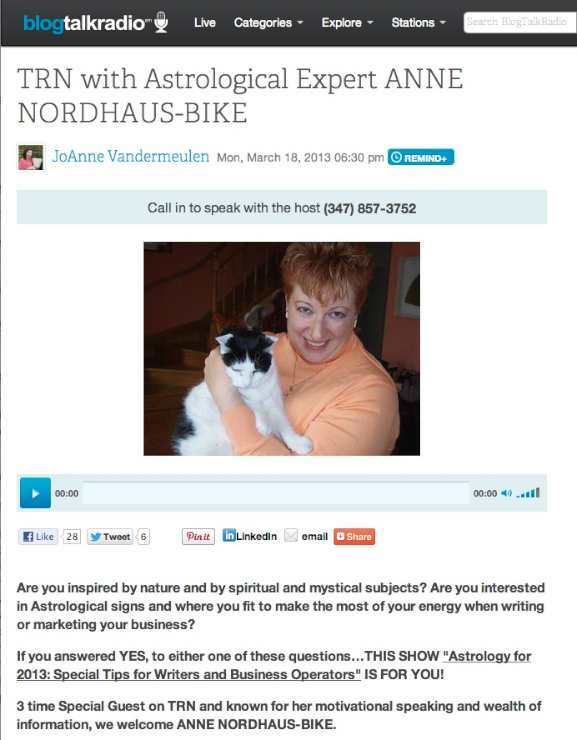 To access the show, go to http://www.blogtalkradio.com/prempromotions/2013/03/18/trn-with-astrological-expert-anne-nordhaus-bike. Or use the Blog Talk Radio player widgets on this page (in the right hand column) to hear the April and September shows now.